Vintage original 1987 24 Heures du Mans Race Poster. June 13 & 14, 1987. 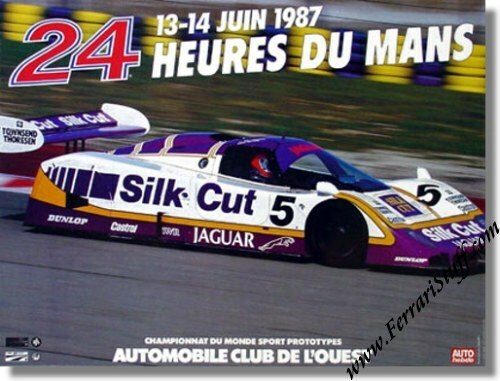 The poster shows the # 5 Jaguar XJR-8 LM (S/N 286) of Jan Lammers / Win Percy / John Watson during practise (They would crash out of the race in lap 158). The race was won by Hans-Joachim Stuck / Derek Bell / Al Holbert in their # 17 Porsche 962 C with a total of 354 laps to their name. For the full results of this race, please see 24 Heures du Mans results 1987. No Ferraris were engaged this year.